Sniff, sniff, sniffle. How can anyone eat this onion if I cry all over it? 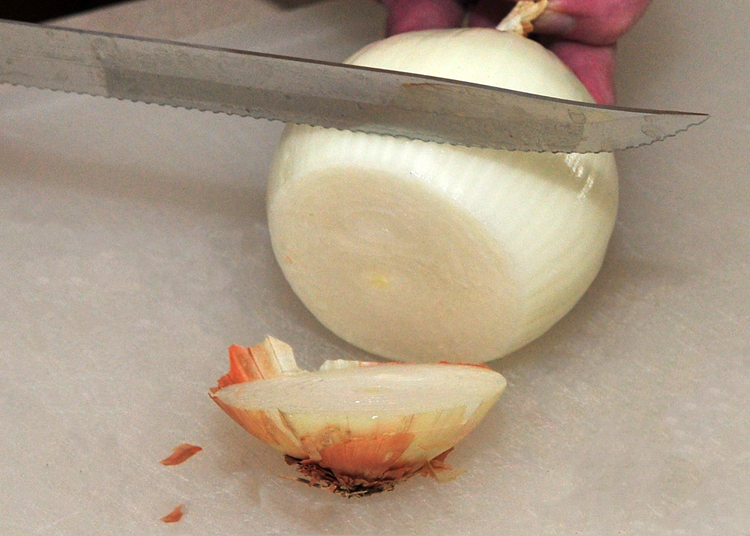 For years, I dreaded the awful task of slicing or dicing onion. Now I always volunteer to slice or dice onions at the homes of family and friends. Why? Because someone gave me the best tip in the world. Even with my contacts, no tears. The tip came at a Pampered Chef Party, and I have no idea what the consultant’s name is, but if you are the one and read this, please let me know so that you can get credit. Cut the roots off first. Slice from the base moving back towards the top. Before this, I tried holding bread in my mouth, putting the onion under water, everything anyone said do. Nothing worked. The opening scene from Like Water for Chocolate was lodged in my brain. No more. Happy slicing. Enjoy those hamburgers. Cry no more. After writing this, a quick search showed me that while I know little about being a chef, the professional cooks do not know this secret. A chemist friend of mine explained once that two chemicals in the onion combine when it is sliced creating toxic fumes. One of the chemicals, I don’t remember which, is housed in the roots. By cutting the root off first, that chemical is never released to combine with the one in the onion. Apparently, the juice inside the onion is stimulated by slicing and creates a flow that activates the root system also when cut from the top. Here is a very good site showing the current standard in the cooking profession by Jennifer Clair from Home Cooking New York. And then there is an informative and fun article which explains the chemical reaction set off when slicing an onion at Lifestyle. The entrenched professional wisdom is: half the onion and cut very fast so that you do not get the full impact of the toxic fumes. Now the two links above give a pretty good repertoire of knowledge about slicing onions. Think I will stick with what works for me, besides that, I like a whole round onion slice on hamburgers, not a half. Click on the Pampered Chef link. At their site, download a free celebrity cookbook and they will donate one meal to Feeding America.